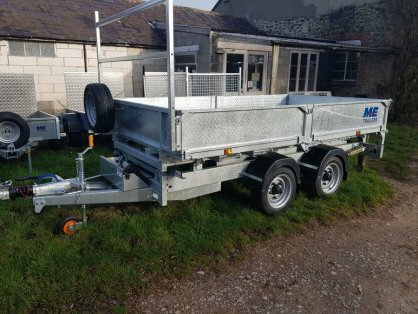 The MET35105 Trailer Chassis is fitted with M+E manufactured heavy duty, low maintenance rubber torsion axles, and has provision for ramp storage. The suspension has been proven in the Construction Plant industry and it has excellent ride characteristics to cope with operation in both laden and unladen conditions. The Tipper body is mounted to the base by utilising 2 rear low friction bearings and a 3 stage hydraulic ram. When in the down position large side guilds locate the body, which sits on progressive rubber landing pads, significantly reducing noise. The one piece Aluminium Clad Floor ensures easy tipping, and the tailboard hinges from the top or the bottom, to allow ‘Tip Thru’ operation. The hydraulic ram features class leading kinetic geometry to ensure a highly efficient tip, without compromising ground clearance so critical for dirt track or on site towing, and thereby maximising the number of lifts per charge of the heavy duty battery. The Power Pack is housed behind a protective cowl. The fail safe hydraulic system also includes an effective manual back up pump. The Pendant Control (with wander lead) plugs into the power pack enabling the tipping operation to be monitored and controlled safely from the side. The Control is magnetised for ease of use.